We've just been cleaning and cleaning and packing and moving and yeah. Busy busy busyyyy! And it's only 1 more week until the big official move! But, today I'm coordinating a wedding. It should be beautiful and lots of fun! My hubby likes porters and stouts. But he also doesn't really drink much, especially if there's no one drinking with him (and I don't drink sooo...)--so long story short, we've had a couple bottles of Michael's favorite milk stout sitting in our refrigerator since like November. And he had an ice cream craving. So I made him a treat! 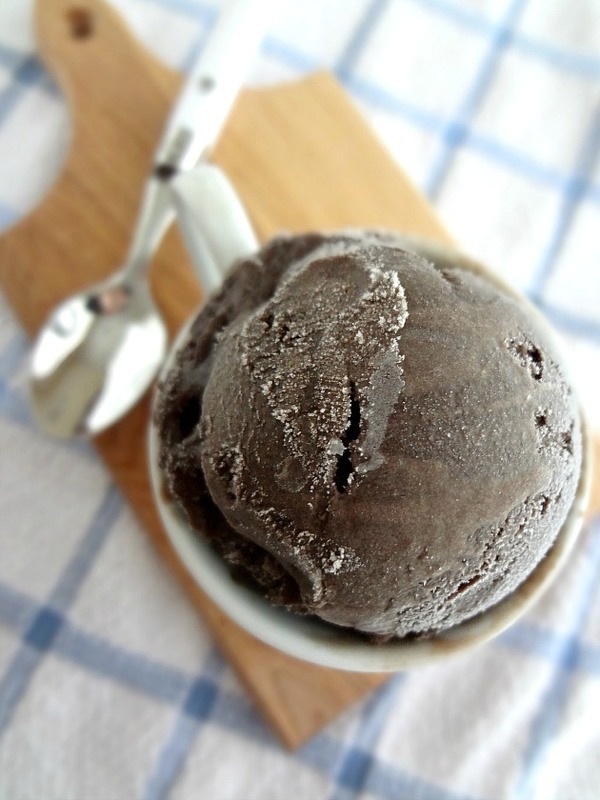 Here's a hilarious fact--this ice cream is technically somewhat alcoholic. Michael kept telling people that the alcohol cooked out and then I had to inform him that no...the ice cream isn't cooked at all after the addition of the beer. So technically yeah there's some alcohol in there. Then he asked if I'd been getting him drunk on ice cream and I gave him the eye roll to end all eye rolls. Anyway, probs don't give this ice cream to your children. This is purely for adults. For the record--I didn't think the ice cream tasted like beer at all. I thought it was just super chocolatey, which I, of course, am always totally here for. Michael said he could tell, but who ever knows with that guy. 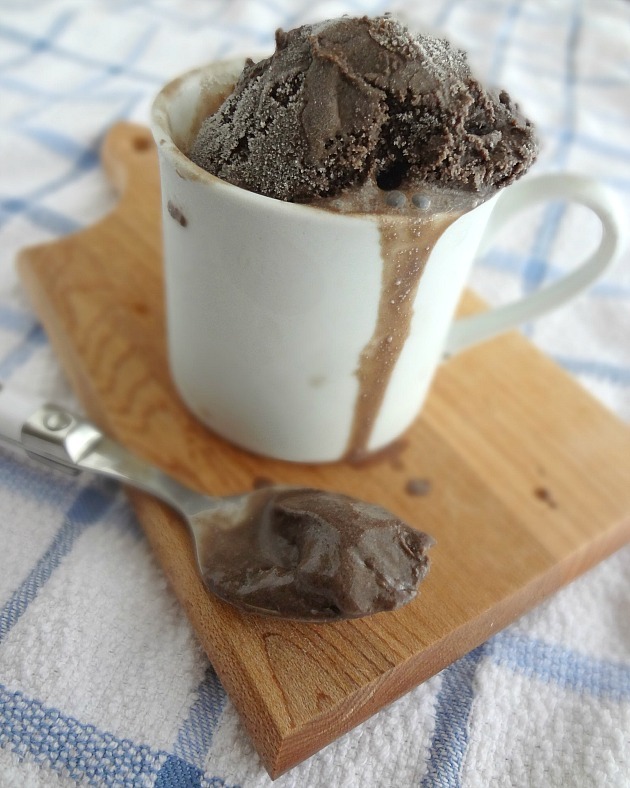 Anyway-the ice cream is super dense and chocolatey and pretty awesome. And you can use up any stouts or porters you may have hanging out in your refrigerator. So it's pretty much good stuff all around. Oh! 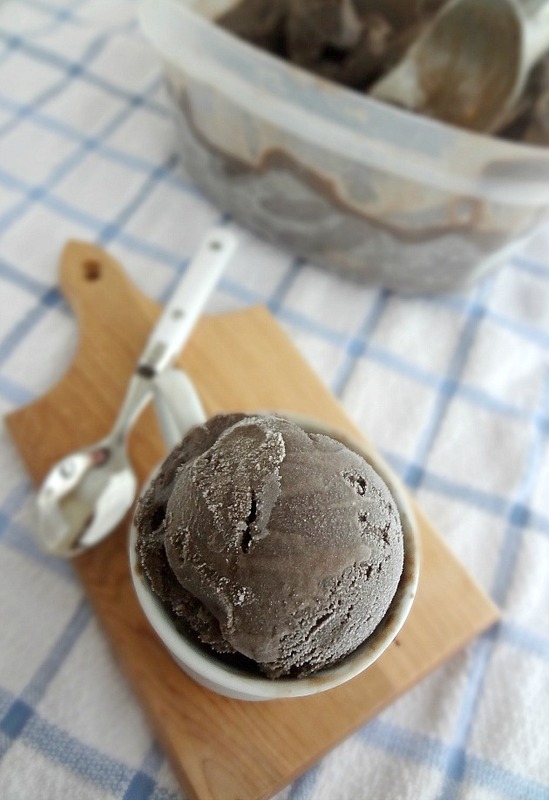 And make sure you read these instructions before getting your hopes up for ice cream ASAP--the mixture needs to chill for awhile before being able to be put into the ice cream maker. Just warning ya. And then realized that we needed new carpets (the house is 5 years old but the previous owners apparently were just the worst because the house is definitely not clean and there are stains on ALL THE CARPETS). So that's been an adventure trying to figure that out and lamenting all the money we're about to say goodbye to. BUT we really like the new carpet we chose so that'll be good. Plus they have interest free financing for a year, so we don't have to say goodbye to all of our money right now lol. We've also started moving some boxes over there and got the locks changed and all the jazz. IT'S MICHAEL'S 30TH BIRTHDAY!!!!!! My sweet sweet hubby turns 30 today and he requested that his mom and siblings and I all hang out in the mostly empty new house and play games and eat! His mom is bringing tacos and burritos, I'm picking up wings, and I'm also putting together an ice cream bar (featuring homemade coffee chocolate chip ice cream at the birthday boy's request as well as my fave salted caramel sauce as one of the toppings for the toppings bar). Tomorrow we're having my mom, grandma, cousin, and Michael's mom all help clean the house! It's a big job that I am nooot looking forward to lol. EVERYTHING IS STARTING TO HAPPEN!!!! We're officially clear to close so next week we'll be closing, switching over all the utilities, and getting possession of the house!!! EEEEEEE! And that means that the packing has begun. We're going to try to slowly move stuff over and then have a big move (with all the big stuff and the moving truck and such) on October 1st. In other news, the wedding last weekend went great! It was a Greek wedding/rustic barn wedding.....it was an interesting combo lol but so lovely! I also had a meeting with a bride whose wedding is in a couple weeks to go over final details, so fun fun! Labor Day weekend was so nice-we had the final pool party at my grandma's and then on Monday Michael and I relaxed and also got some packing done. Other than that I've just been working and getting stuff done! I promise, I'll be sharing a picture of our new house soon! And sharing the many many projects and things that I want to do for it lol. I'm sorry guys. I know it's been like 2 months since I posted any new recipes for you and I'm seriously sorry-between this whole buying a house thing, various summer activities, and my brother visiting....I've just been sort of insanely busy. And I can't even say it won't happen again. We're still dealing with the house/moving situation (although we're officially going to be in possession of it on Sept. 16th!!) and life is just kinda crazy, ya know? So I'm just going to try not to worry about it and take it one day and one recipe at a time. I hope that's cool? Cuz I love you guys. I just feeeeel like....onions make everything better? That's my opinion, anyway. They're so darned flavorful and delicious and make everything they're in taste amazing too. I also want to like french onion soup, for this reason, but for some reason it never really quite works for me. 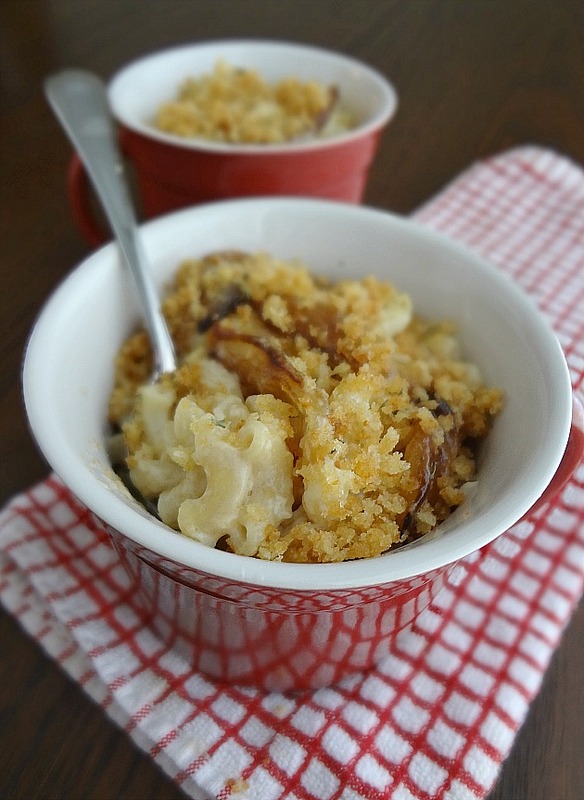 But french onion MAC AND CHEESE? Yeah. That I can get on board with. 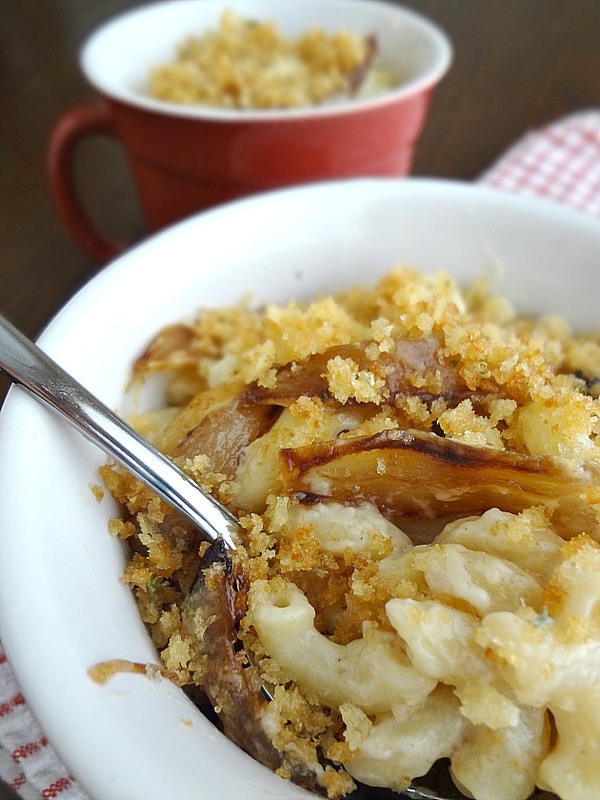 It's just insanely flavorful macaroni and cheese (don't be scared of the gruyere-it's subtle. 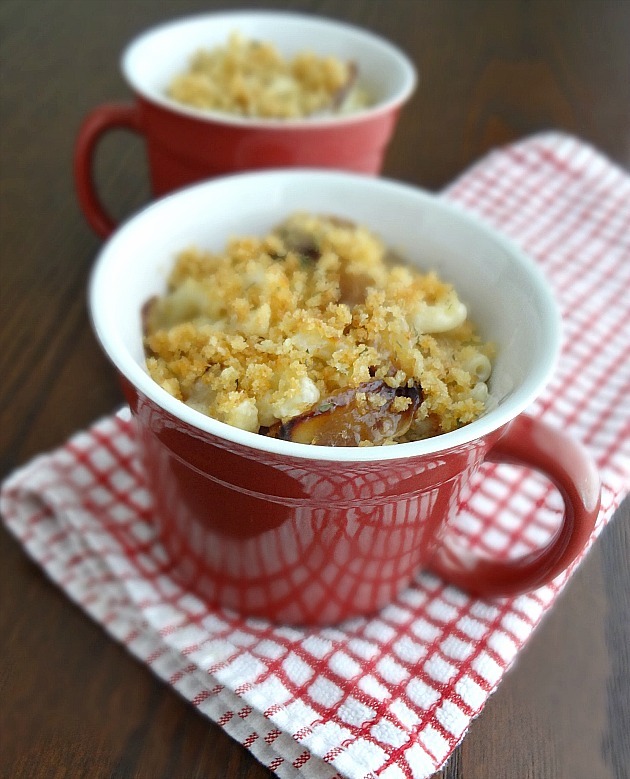 But also feel free to sub in a different cheese if you really want) that's creamy and has yummy yummy onions and is topped with buttery toasted breadcrumbs. Yessss. Hey-good news. I actually have a new recipe coming up this week-woo! Last weekend I had an awesome time working at a wedding that was on a family's personal estate-it was seriously so beautiful and, even though we had some unexpected storms to deal with, it turned out pretty perfect :) And I'm working another wedding today--FUN FUN FUN! Then om Sunday we had another party at my grandma's pool, at which I swam more than I have in yeeears. It was fun, but exhausting! Monday I just hung out with my brother all day, we watched home movies and ran errands and got lunch at Savor. Then we had dinner with our dad and uncle at Royal Docks Brewing Co. Then I pretty much just hung out with my brother for as long as possible on Wednesday before he left for his base assignment in Hawaii :( I miss him already! On the house front-got the quote back for some of the changes I want to make to the house aaaand....they were insanely expensive. (I'm talking for cabinets alone it was $7200 for cabinets, $5000 for the labor of removing old cabinets and installing new ones, and +1250 to move the granite that is currently on the old cabinets.....WHAT?) Soooo we're going to hold off on that for a teensy bit of time (although I'm also going to look into 2nd and 3rd opinions) and try to tackle some projects DIY style (currently that includes a tiny bit of work to make the super small mudroom/laundry room a bit more functional, painting the cabinets in the bathrooms, and painting the brick on the outside of the house--although we may end up hiring out on that. Still researching.) We also got the appraisal back and all is good there soooo yay-things are moving forward!